So I asked her, in addition to all the photo challenges, to help me with my writing. She has given me writing prompts before. Half sentences to write from. Some of them I still haven't used. Some I haven't finished. And some I've tried to work with. Some have come out badly. And some I'm actually quite pleased with. Some I want to return to one day. And the tale of Gerald eating the washing is complete. This time she said, "A week on, I suddenly realised how traumatised I was by"
This morning I decided that a postcard was the source of the trauma. This afternoon, with only that tiny sliver of knowledge about the situation, I sat down and wrote and by the time I had positioned the cursor I knew the name of the person who sent the card. As I typed I learned more. Mostly this is pretty free written. But it took a while to work out what should be on the front of the postcard. In my thoughts, at one point it was a tourist card from London, then it became a card of a hill in the Lake District, then an old card of a motorway service station. And then it finally was set as a 1970s postcard of the shopping square in Crawley town centre. I know that the giver of the prompt will appreciate that. I found a card online and used that. But then I wanted to post the card myself and didn't want to borrow someone else's photo of a postcard. Fortunately I happen to own exactly the same card. So the photo below is my own. So here's the story. Only very, very slightly edited afterwards. A week on, I suddenly realised how traumatised I was by Niamh's postcard. I had nearly thrown it away without noticing it was there because the postman had inadvertently tucked it into the middle of some colourful touts for pizza parlours, ice cream parlours, and maybe massage parlours too. It was only when chucking it all into the recycling bin outside that the postcard slipped away from its surrounding sales leaflets and had fallen onto the ground, wet from the rain. I'd reached down quickly to pick it up, as if a little rain would somehow damage the rubbish, and it was only when picking it up that I spotted that it was what it was. The picture on the front of the card was not one I would have been in a rush to see. 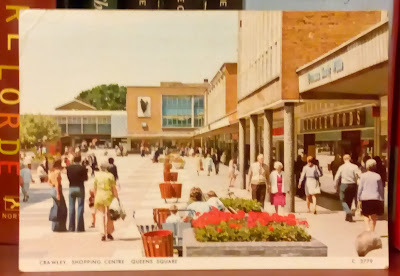 It was a photograph, probably from the 1970s, of Queen's Square in Crawley. I hurried back inside and dried off the card with a tea towel, hoping that any ink wouldn't be too smudged. I looked again at the photo and smiled, my smile a mix of pleasure and half remembered pain. In the background was the old Co-operative building and on the right were names from a shopping environment that is no more. Woolworths. Littlewoods. Freeman Hardy Willis. I knew those names of course, but they had vanished from Crawley by the time I visited the town. There was really only one person who would have sent me a card like this. Niamh. She whom I had loved in spite of everything. She whom I had lost. She whose words had nearly broken me. Niamh. After five years. Years of regret, of recovery, of release, and of a new happiness and a new beginning. Niamh. It was true. We did add lots of colour to the place and I confess I let out a big laugh. Because Niamh still couldn't get her apostrophes right. And because we did add colour to the square. We would go there on sunny days with a picnic hamper and we would wear the most outrageously bright clothes we could find and it didn't matter how strange we looked. And we would lie in the middle of the square with parasols and poetry books and would sing the poems to each other, inventing the tunes as we went along or singing the sonnets of Shakespeare to the tunes of nursery rhymes. We would laugh and drink lemonade and the people of the town would stare as they passed. And for a time we would be happy together. I laughed again and then stopped and thought. The card led to too many questions. Too many. Did Niamh really still think of me as her Grace after so long? Were her words really a veiled statement? Would she be visiting the North East? And would she be looking me up and wanting to see me again? And what for? And come to think of it, how did Niamh know my address at all? I thought I'd made sure to cut all my ties to the life I'd had in the south. I had left behind the few friends I had there. I'd not told a soul where I was going. I'd changed my bank accounts. I'd even changed my surname by deed poll. A new start deserved a new name. Too many questions. And no answers. But there didn't seem a lot of point worrying about it. Worry wouldn't provide the answers. So I resolved to forget about the card if I could. Under my bed I kept a single box of items I'd kept from that old life. Some photos, a few souvenirs. Nothing special. I wasn't even sure why I'd kept them. But I had kept them and decided to put the postcard into the box. I looked through the contents for a few minutes. There were a few pictures of Niamh of course and I could see a part of what had attracted me to her in the first place. I remembered our first meeting, during a terrorist scare in London. The railway terminus had been closed and we had both taken refuge in a cafe nearby. We had been sitting at the same slightly dirty metal table. A bit of grubbiness was preferable to standing in the street. She had been drinking a black coffee and I a mug of tea and somehow we had got to talking. About the miserable weather. About how the threat of terrorism was getting out of hand and how we hadn't seen it like this since the IRA put down their weapons. Time dragged on and we weren't being allowed back into the station. The journey home that night was going to be awful. Niamh had offered to buy me another drink and I'd been happy to accept and then we got talking about each other. I noticed her smile and when she laughed I felt warmed inside. Or was that just the tea? And that was that. We found we had things in common. Something clicked. And we exchanged telephone numbers with the promise that one of us would call the other during the week. I can't say for sure whether I actually planned to call her. Or whether I thought she would ever call me. In truth I thought I'd probably never see Niamh again. We had shared a couple of unpleasant hours in a bomb scare, made pleasant by also sharing in each other's stories and smiles. I didn't call Niamh. Of course I didn't. I was scared to. And she didn't call me. Not during the week. And not during the week after either. It was twenty-three days before she called. I know. I checked them on a calendar afterwards. She called, apologetic for not calling earlier. She said that life had been very busy and there had been a family emergency but that she had enjoyed our drinks together and wondered whether I'd like to meet again somewhere for more drinks. Preferably not during a bomb scare. Preferably in some place less crowded than a London cafe during a bomb scare. And preferably somewhere with clean tables and more comfortable chairs. So we had agreed to meet. Not in Crawley. That came later. We met there several times. The first time we were there we both noticed its sense of unremitting greyness. Everything we saw was so normal. Nobody was flamboyant. Nobody looked crazy. Everyone seemed average. Average and grey. So we had arranged to go back. And be abnormal. Flamboyant. Crazy. To shine like stars in the middle of Queen's Square. And each time we had become more crazy and attracted more stares. I remembered our first meeting. I remembered Crawley. I remembered that last time when our harmless play led to the local police threatening to arrest us if we didn't move on. They seemed to think that only alcohol or drugs would lead to flamboyant and crazy behaviour in a place like Queen's Square. As we walked back to the station – she to return to Croydon and I to Arundel – we decided never again to return to Crawley. If it couldn't cope with our brightness then it shouldn't have to. I smiled as I remembered the happy times. What followed was a disaster for me. Niamh could light up my mind and my heart and do so with the song of a rainbow. But she could also light them up like a furnace and burn away every comfort I possessed within. I chose not to consider all that and I placed her postcard on top of the photos, closed the lid of the box, and pushed it back under the bed. A week later, while drinking tea, I consciously noticed that I was thinking about Niamh and that the words of the postcard were in my head. And then I consciously noticed that I'd been thinking about that card a lot. I hadn't forgotten about it at all and those questions had been going round in the back of my head without me even noticing. How had she known my address? Why had she sent the card? Did she think of me as hers? God forbid that. Would she ever turn up in my life again with more than a postcard? Please. God. No. Maybe it was just innocent. Maybe she had seen the card and smiled at the memories. Maybe there was some reason she knew where I was and I hadn't cut myself off from my past as thoroughly as I'd wanted to. I wanted to believe it. Maybe. I wanted to forget about it. But this was Niamh and there was no forgetting what she put me through, not even after five years. I realised I'd been subconsciously worrying for a week. That the card was out of sight under the bed. But not out of mind. I realised that the card had brought my past into my present, five year old wounds reopening. I realised that, even if the card was an innocent gift, the words had sliced into me and drawn blood. I knew that Niamh was not over. And I knew fear again. I sat and shook. And cried.